After putting out two collections featuring music from the fifties and sixties, respectively, Barry Manilow now interprets songs from the decade that coincides with the peak of his own success on The Greatest Songs of the Seventies. 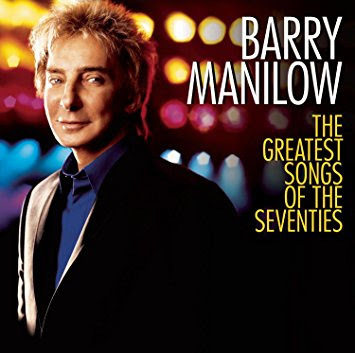 This compilation should appeal to his loyal fanbase regardless but, despite that, the album works because Manilow decided to cover songs that assimilate stylistically well with the music he produced during the same era. Logically, those who enjoy the sounds of the Carpenters, Christopher Cross, and Bread from the 1970s most likely enjoy the music of Barry Manilow as well. It’s not as if he’s covering Black Sabbath, AC/DC, or Led Zeppelin here. Moreover, the hallmarks of Manilow’s music, with its sophisticated production, pristine vocals, and affective flair for melodrama, all work their way onto this album. For instance, “If” features a more sweeping string arrangement than the already-lush original version without losing any of the song’s idealistic charm. As well, “The Long And Winding Road” resembles the Phil Spector production on Let It Be, which might make Paul McCartney cringe, but those who appreciate Barry Manilow’s gift for turning schmaltzy music into an emotional wellspring will love it. By and large, the songs on this album stay quite close to their original arrangements, yet Manilow capably offers moving vocal performances, making a good number of them worthy interpretations. “My Eyes Adored You” and “Sorry Seems To Be The Hardest Word” exemplify this point. The track that benefits most from Manilow’s near-faithful renditions, though, is “(They Long To Be) Close To You,” which suggests Burt Bacharach’s precise instrumentation while evoking the optimism of Karen Carpenter’s seminal vocal performance. However, where Manilow excels in the intricacies of the previous song, he falls short with the same approach on “Sailing”. In its first incarnation, Christopher Cross sang the lyrics in near imperceptible tones, wispy like the music, ultimately creating the very atmosphere the song described. In Manilow’s rendition, each syllable is enunciated and prominent in the mix, which kills the mood that this song could so pleasantly capture. Another misstep comes on “Bridge Over Troubled Water,” which is one of those classics that, unless an artist approaches it with a sensibility that’s divergent from the original version (like Aretha Franklin’s gospel rendition, for example), it’s best not to tackle it at all. Manilow certainly does an acceptable job, but it’s not extraordinary. It should be, though, because this is an extraordinary song. Following the album proper, six acoustic performances comprising some of Manilow’s most recognizable seventies songs convey the merit and the emotional impact of his songwriting during that decade. While “Copacabana” fails to thrive in this context, the five piano ballads that round out this portion, especially “Weekend In New England” and “Looks Like We Made It,” sound exquisite. Overall, The Greatest Songs of the Seventies is of sufficient quality to make the album worthwhile. Barry Manilow neither strays far from the original versions of these songs nor from the type of music his fans have come to expect and appreciate, but there’s absolutely nothing wrong with that.